Mumbai Has A Snow Park, So Why The Hell Haven't You Been There Yet? Have you always wondered what it's like to play with snow? Are you the type who likes to plan holidays during the winter, hoping to catch a glimpse of white? Honestly, you don't have to push yourself that far, Mumbai's got just the place for you - enjoy ice skating and so much more ay Snow World. You may have seen Snow World in Phoenix Marketcity before, but in case you haven’t visited – here’s the lowdown. 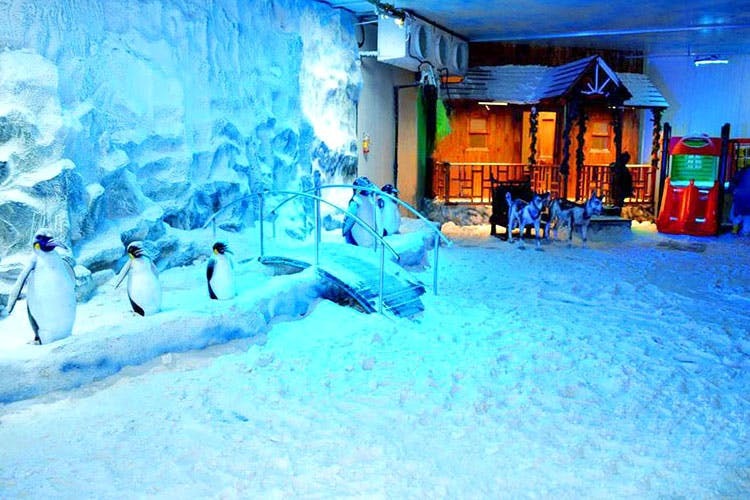 Snow World is an enclosure they’ve created which counts as one of the first artificial snow parks in India. There are a bunch of activities that you can take part in – from ice-skating, snowboarding, snow sledding and even snow dances. If you're in the mood for adventure, you can enter the snow tunnel, climb up the snow mountain, explore the Roman wall or even camp inside an igloo. The charges are INR 575 per head for an hour of being in the snowpark. Within this time limit, you can avail any of the activities. They provide jackets, shoes and gloves required for being in the park. Remember to carry your own socks, though. Honestly, it is a small space but works if you want to take part in an unusual activity. It is open from 11 AM to 9 PM.